After my series of posts about summer cottage decorating, I have been flooded with suggestions and ideas for similar places to visit. Case in point, a few people have mentioned Maine Cottage, a designer, manufacturer and seller of home furnishings that compliment coastal living. Oddly, Maine Cottage is based in Maryland where they have a retail outlet. However, they do sell online and offer a nice selection of furnishings in multiple patterns. I love the wicker Fiona Rocker – just what I need to sit in on the back porch listening to the symphony of crickets into the wee hours. I of course did not mean literally in my back yard, but figuratively, as the rocky summit of Mt. Chocorua can be spotted all over town, and I feel in some ways it is the beacon that watches over me. It is like when I am in New York and always looking for the steeple of the Chrysler Building to orient myself and feel a special sense of place. Anyway, I realized that were you to flatten the acres of protected forest that actually does abut my sabbatical retreat’s back yard, I would have a lovely view of the mountain. I love Mt. 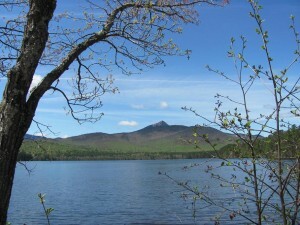 Chocorua and I am not alone. 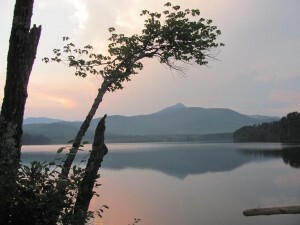 Even though at 3,490 feet it is clearly modest by mountain standards, Chocorua is very picturesque with it’s bald peak and proximity to the lake that bears the same name. Urban legend has it that Chocorua is “the most photographed mountain in the world.” How one quantifies that, I don’t know. But sitting right off a major route to the White Mountains well traveled by tourists, skiers and nature lovers, one can see how people are compelled to pull off the road to take a photo of this lovely site. Unlike the New Yorker who has never visited the Statue of Liberty, even with Chocorua “in my back yard” I visit often and takes pictures. Since I have been living up here in NH, I have made a practice of making sure I have a camera in the car with me all the time as I often stumble upon something that needs to be documented. I have been chronicling the every changing view of Mt. 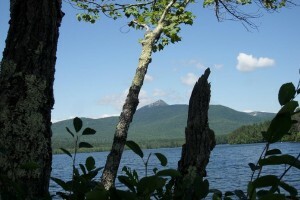 Chocorua and am always amazed at its beauty. Here are three pictures I tool of Mt. Chocorua in the past few months. 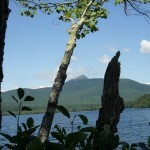 From left to right and/or top to bottom depending on your screen dimensions: Chocorua in Mid-May with the greenery making its way up the southern slopes; Chocorua at twilight in late June; and mid-day on a bright July day. Lost Cowboy is powered by	WordPress 5.0.4 and delivered to you in 0.781 seconds using 42 queries.